Warm Pan-seared vegetables tossed in a Tangy Herb Yoghurt Dressing and finished with a drizzle of Turkish Herb Chilli oil….a salad that will leave you wondering, how can simple everyday vegetables taste soooo good!! Pan-sear sliced zucchini, mushrooms, peppers, eggplant one by one and keep aside. Do not add salt at this stage, so that the vegetables retain most of their moisture. Once they cool down a little, add sliced tomatoes & the tangy yoghurt dressing and mix gently. Slide onto serving platter. 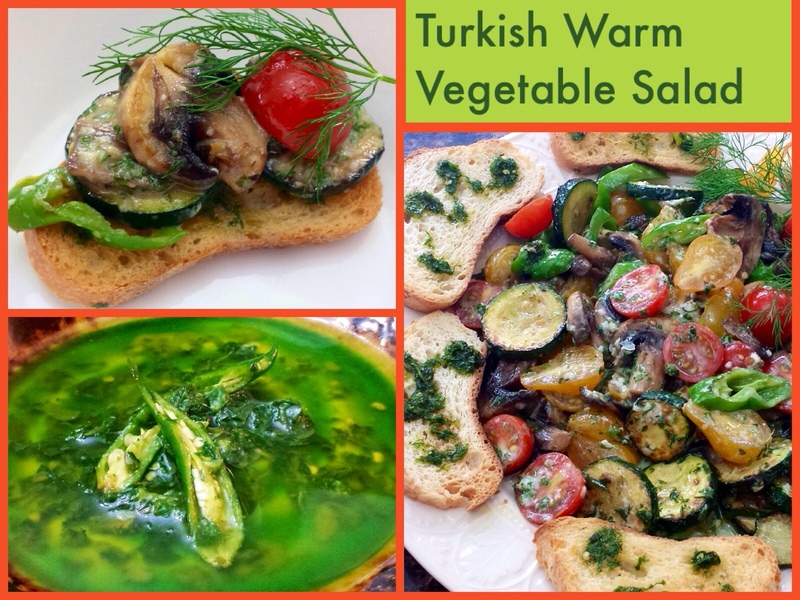 Drizzle some Turkish herb chilli oil on top and serve with crusty bread! Add minced garlic, chillies & mint to yoghurt along with salt & pepper to taste. Finish with a generous squeeze of lime. Pound 2 tbsp. flat leafed parsley, 1tbsp mint, 2 tbsp dill, 3 big chillies, 2-3 cloves of garlic, 1/2 tsp all spice powder, 1 tsp cumin & salt into a coarse mix using a little olive oil. Remove in a bowl and add some more olive oil to get a pouring consistency. Baked Tomato Herb Rice Cups!